We all have those huge BBQ fails now and then or even little errors that make the grill-out less than stellar. 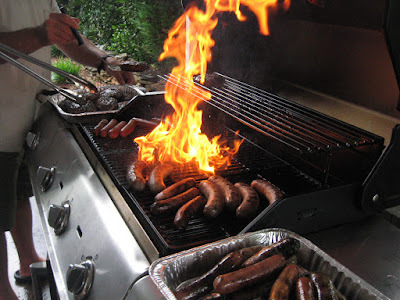 Someone forgot to empty the grease holder in the back of the grill before a simple hot dog and hamburger grill out (above), and it took some quick moving to save the day. I jerked the grill door open and cut the gas which worked like a charm. And, I cleaned out the drip box for the owners (who may not have even been aware that it was hidden in the back of the grill). If you grill much at all, I'm guessing that you have your own barbecue blooper in mind. Or, maybe you are just starting out and want to avoid the most common mistakes. My friend, Robert Mazarella, put together an excellent guide to the bad and ugly of barbecue by checking in with the experts (including me). Check out his barbecue guide which includes many of the top names in barbecue grilling sharing their tips and hints for outdoor grilling success every time (or most of the time). I know you'll enjoy his barbecue site and his guide for the best barbeques.